No glass, No worries. Leave the bottle at home! 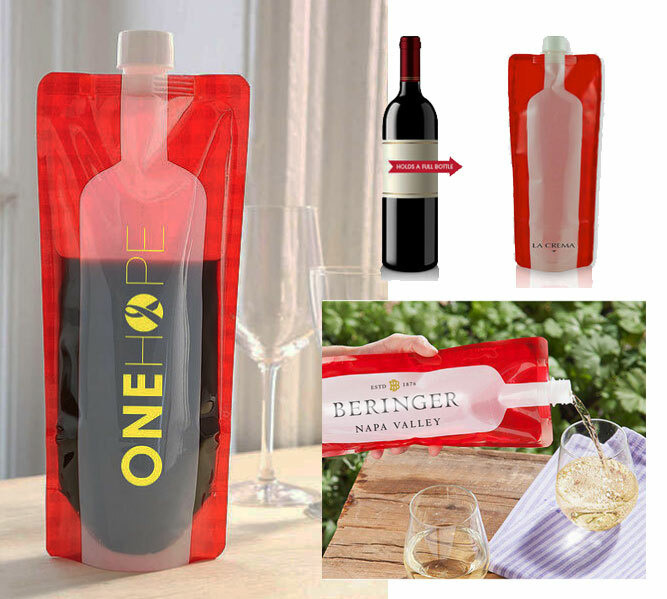 This foldable, reusable, disposable,100% recyclable, leakproof wine bottle to easily take wine and other beverages on the go. It's a pliable, liquid-tight container that takes wine to parties, BBQs, picnics, concerts, tailgating, parks, lakes, beaches, hiking, and more. Simply fill, stow it, and go! No more broken glass bottles during transport or losing bottles at events. When ready for a glass of wine, unscrew the cap, pour, and recap. No fussing with wine corks or bottle stoppers to reseal the unused wine. When the contents are used, simply dispose of it in trash can, or roll it up, cap it and take it home to clean and reuse. Rinse with warm water and allow to dry thoroughly. Made from BPA-free plastic with no metal parts. The wine bottle holds a full 750-milliliter bottle of wine.